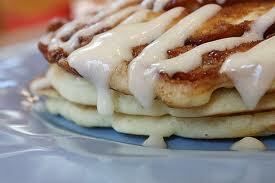 Cream Cheese Icing to turn your favorite pancake or french toast recipe into a Cinn-a-Stack treat. Cinnamon Sauce: Melt butter in a saucepan over medium heat. Stir in brown sugar, cinnamon, salt, and cloves and cook while stirring constantly until mixture is smooth. Whisk in flour until well combined. Cook 1 minute whiles stirring constantly. Add half-n-half, whisk until smooth and cook until mixture comes to a simmer. Remove from heat. Cream Cheese Icing: Combine all ingredients for cream cheese icing in bowl. With electric mixer beat until smooth. Spoon icing into a piping bag or plastic squirt bottle. To Assemble: Spread about one tablespoon of cinnamon sauce on top of each pancake, or slice of French toast and stack them. Drizzle cream cheese icing over the top, and place a dollop of whipped cream on top of stack. NOTES: You can always use store bought icing if you are in a hurry and don't want to bother with making it from scratch. CINN-A-STACK French Toast A stack of three slices of thick-cut French toast layered with a luscious cinnamon roll filling, then drizzled with rich cream cheese icing and topped with whipped topping.